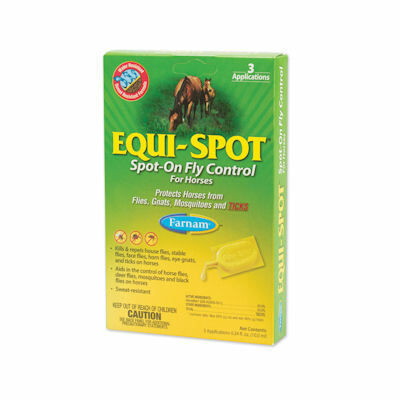 Equi-Spot (Farnam) 6 Week long Fly Control for Horses. Contains 45% Permethrin that kills and repells flies,gnats,mosquitoes and ticks on horses for 14 days. Will not wash off or sweat off. It is Citronella Scented. Do not reapply for 14 days (2 weeks) Safe for all horses. Do not use on foals under 3 months of age. Apply one 10ml tube as follows: 5ml along the back line, 1 ml top of forehead under forelock, 1ml to front of each foreleg, 1ml to front of each hind leg.